DIRECTIONS: This cemetery is 1/8 mile west of Thayer's Corners, and 3 1/2 miles from Chateaugay, on the north side of Route 11. 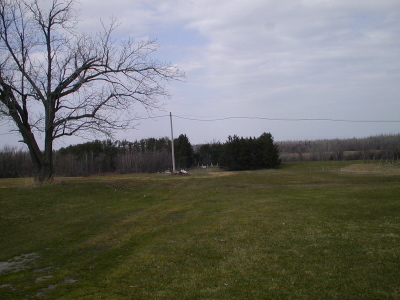 It is approximately 500 feet from Route 11, but is clearly visible from the road. This cemetery has been transcribed at least three separate times. The first transcription was compiled by Mrs. George Humphrey and Elizabeth Coleman on 27 November 1937. H. & W. McLellan conducted their transcription on September 2, 1940. 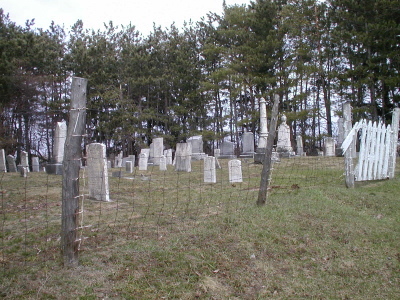 Michael & Joyce Ranieri conducted an independent transcription and photographed the cemetery on 21 April 2001. Upon completion, all three transcriptions were compared. Discrepancies were resolved by re-checking the stones and digital photographs. Unresolved discrepancies are indicated in red. Several stones listed by earlier transcriptions are now missing. These are identified with a note. Alexander ANDERSON Died June 12, 1911 AE 79 Yrs. Raichel His Wife Died Nov. 1, 1912 AE 80 Yrs. & 11 Mos. Christie Died July 27, 1890 AE 22 Yrs. A precious one from us has gone. Warren BOTSFORD Died Feb. 10, 1856 Aged 76 Years. In memory of Mrs. Cynthia BOTSFORD, wife of Mr. Warren BOTSFORD who died Sept. 26, 1812 in the 33 year of her age. Electa Wife of Warren BOTSFORD Died Jan. 25, 1852 Aged 82 years. Loren BOTSFORD Died May 10, 1865 AE 60 ys. 4 ms. 10 ds. Henry BOTSFORD Died April 10, 1890 Aged 53 Yrs. 2 Mos 14 Dys. Judith Wife of Francis CELLEY Died July 25, 1852 AE 59 years. Rufus A. Son of R. D. & M. H. CELLEY Died Apr. 18, 1852 Aged 21 days. God called the one He thot best. Amasa CHAMBERLIN Died Feb. 1, 1861 AE 89 Yrs. All thy mourning days are oer. Harriet, Wife of Amasa CHAMBERLIN Died April 30, 1874 In her 74th year. Hattie E. Wife of Alonson A. CHAMBERLAIN Died Aug. 6th, 1888 AE 50 Yrs 9 Mos 2 Ds Gone but not forgotten. Alfred Son of L. & H. CHAMBERLAN died Sept. 1, 1865 AE 2 Mos. Nellie L. Dau. of A. & H. CHAMBERLIN Died Oct. 5, 1878 AE 1 Yr. 9 Mos. A. W. CHAMBERLIN Died Sept. 11th, 1878, In his 37 year. His loss we deeply feel. Mary Jane, daughter of C. & O. CHAMBERLIN Died Aug. 8, 1847 aged 3 years. David DAY Died Aug. 6, 1845 AE 87 Ys. Eunice, Wife of Dea. N. DAY Died Oct. 29, 1866 (1860??) AE 78 Yrs. & 6 Months. Rosanna A. COWLS Adapted [sic] Daughter of Nathaniel & Eunice DAY died Dec. 23, 1844 AE 23 years. Mary J. wife of Levi DREW Died May 11, 1864 Aged 26 Years. I am not lost but gone before. Joseph EARLE Died May 4, 1875 AE 79 ys. & 10 ds. Betsey, Wife of Joseph EARLE Died Nov. 9, 1864 AE 65 Yrs. Blessed are the dead who die in the Lord. Ira EGLESTON Died June 18, 1850 Aged 48 years. which none ever awake to weep. Sarah Wife of Ira EGGLESTON Died Dec. 31, 1852 Aged 48 years. And in my saviour's image rise. Maria M. Wife of Charles W. FAY, Died July 31, 1890. AE 74 Yrs. Thou art gone yet we love thee still. WM FINNEY Died Oct. 17, 1898 Aged 76 Y'rs. Rachel His Wife Died Mar. 8, 1911 AE 80 Y'rs. Frank Son of W. & R. FINNEY Died Mar. 22, 1900 AE 49 Y'rs. Luella Dau. of W. & R. FINNEY Died June 6, 1866 AE 14 M's. 14 D's. Florance E. PAUL wife of Cashus GILETTE Died May 10, 1918. AE 51 Yrs. Abram GILLETT, Died Oct. 11, 1867 AE 62 yrs. & 8 mo. Julia GILLETT Wife of A. GILLETT, Died Feb. 19, 1873 AE 68 Yrs. Mary J. Daught of Abram & Julia GILLIT Died Mar. 1, 1812 AE 4 Yrs. David M. Son of D. M. & B. M. GORDON Died Aug. 26, 1864 Aged 1 Year & 10 Months. Sarah L. Daughter of H. & L. E. GREEN, Died June 7, 1875 AE 17 Yrs. Thou art gone, yet we love thee still. Mary E. Dau. of H. & L. E. GREEN Died June 17, 1874 AE 9 mos. Peter HALL Died Mar. 14, 1843 Aged 33 years. Almira HALL Died Aug. 8, 1841 In her 28 year. this body, yet in my flesh shall I see God." God called you home he thought it best. George L. Son of C. E. & Susan S. HILL Died May 14, 1846 aged 6 yrs. Hannah H. His Wife Died Dec. 23, 1898 AE 80 Yrs. Albert Son of J. & H. H. KANE Died July 24, 1897 AE 38 Yrs. That increase with growing years. Edward was lost in the woods Oct. 25 was found drowned near east Trout River Oct. 30, 1851. We loved thee well but Jesus loved thee best. Geo. W. LEGGTS Died Feb. 20, 1865 Aged 28 Yrs. Member of Co. H. 13. N.Y. Heavy Artillery. Alexander LEGGETT Died June 27, 1890, AE 80 Yrs. Nathan MASON Died May 19, 1895 Age 68 Yrs. Clarinda HOWELL His Wife Died May 5, 1899 Age 72 Yrs. Marian C. Died July 21, 1880 AE 29 Yrs. Asleep in Jesus. Carlton R. MOE Died May 19, 1899 AE 44 Yrs. Experience. Wife of Rufus MORSE Died Aug. 5, 1869 AE 74 yrs. 2 ms. & 23 ds. For I know that my Redeemer liveth. Emily M. Dau. of R. & E. MORSE Died Dec. 31, 1869 AE 44 ys. 6 ms. & 5 ds. Asenath MOTT Died March 8, 1886 AE 72 Yrs 7 Mos 25 D'ys. Charlotte E. SWEET wife of Ransom PAUL Died July 23, 1922 AE 76 Yrs. Martha H. daughter of R. A. & M. H. PECK Died Sep. 27, 1850 AE 8 mos. Willis W. PERRIGO Died March 8, 1881 AE 23 Yrs. We miss thee at home. James PERRIGO Died March 15, 1881 AE 52 Yrs. Miranda Wife of Ansel POND Died Apr. 21, 1867 AE 52 Yrs. Haskall A. POND Died July 13, 1881 AE 38 Yrs 23 Ds. I shall be satisfied when I awake in thy likeness. Nellie I. Dau. of H. A. & L. POND Died Dec. 26, 1869 AE 2 ms. & 5 ds. Smith C. Son of F. G. & A. M. ROBY Died May 25, 1878 AE 1 Yr. 3 Mo. 18 Days. dwell with God around the throne. it best to take our Lillian home to rest. We know you rest with God. Carl M. SHATTUCK Died Oct. 10, 1912 AE 70 Y'rs. Increase SHELDON Died Apr. 14, 1894 AE 57 Yrs. Oliver W. Died Oct. 27, 1887 AE 26 Yrs. Mary Wife of Abel SMITH Died July 3, 1852 AE 44 Yrs. No more to suffer or to die. Jedediah SMITH Died Mar. 31, 1895 Age 88 Yrs. Edith His Wife Died Oct. 7, 1886 Age 80 Yrs. Mary Died Feb. 11, 1906 Age 71 Yrs. Joshua STICKLE Died Nov. 10, 1867 AE 66 yrs. Melissa Wife of Joshua STICKLE Died May 28, 1899 AE 81 yrs & 9 mos. The days of thy mourning are ended. Edwin M. Son of Marvin & Sophronia STEWART Died Feb. 8, 1870 AE 23 ys & 4 mos. Albert F. Son of Marvin & Sophronia STEWART Died Sept. 24, 1845 Aged 5 years. Minnie A. daughter of Samuel & Sophia STUART Died May 16, 1862 AE 1 yr & 6 ms.
LITTLE WADIE Son of Samuel & Sophia STUART died Jan. 20, 1867 AE 3 yrs. 3 mos & 7 dys. Israel THAYER Died Aug. 31, 1847 AE 74 years. Your loss beloved friends, is my eternal gain. Rena Wife of Dea. Israel THAYER Died Aug. 24, 1836 AE 59 Ys. Sarah 2d Wife of Dea. Israel THAYER Died Jan. 24, 1868 AE 81 Ys. MARY Wife of Wolcott A. THAYER Died Feb. 11, 1860 AE 57 Yrs. Fowler D. THAYER Died June 3, 1879 Aged 69 Yrs. Betsey J. Wife of F. D. THAYER Died July 6, 1868 Aged 54 Yrs. Mary Died Apr. 30, 1842 Aged 14 Yrs. Orson Died Sept. 6, 1840 Aged 3 Mos. Orrin Died Sept. 13, 1840 Aged 3 Mos. & 7 Ds. Marion PERCY Died Oct. 9, 1878 Aged 56 Yrs. Eliza F. His Wife Died Sept. 4, 1868 AE 48 Yrs. Leonard K. THAYER Died Sept. 15, 1893 AE 46 Yrs. Jeremiah THOMAS Died June 30, 1856 In his 37 Year He was killed in the Tornado of 1856. Elizabeth M. Daughter of J. & M. M. THOMAS Died Apr. 10, 1851 AE 6 yrs & 10 ms.
Lucy A. Daughter of J. & M. M. THOMAS Died Oct. 3, 1843 AE 4 Weeks. Amy M. daughter of Lewis & Almeda TOBY Died Apr. 4, 1847 AE 2 yrs. & 6 ms.
Phila Ann daughter of Lewis & Almeda TOBY Died Sep. 5, 1847 AE 1 yr. & 6 ms.
Nell N. Wife of Morton TURNER Died Feb. 26, 1869 AE 19 ys. 8 ms. & 9 ds. Oramell WALKER died Apr. 6, 1862 AE 55 Yrs. Sally WALKER died Sep. 6, 1855 AE 19 yrs. Charles H. Son of R. & H. WALKER Died Aug. 8, 1852 AE 3 yrs & 5 ds. As we see thy narrow dwelling. Nancy J. Wife of Orlando WALKER Died Aug. 2, 1879 AE 31 Ys. 7 Mo. 18 Ds. Behold He cometh in the clouds and every eye shall see Him. Elsie E. Daughter of Allen & Demira WILLMARTH died Sept. 5, 1848 AE 1 yr 5mos & 12 ds. Emma E. daughter of Allen & Demira WILLMARTH Died Sept. 5, 1845 AE 7 yrs. John D. YOUNG Died Sept. 4, 1891 AE 74 yrs. sleep which none ever wake to weep. Adaline Wife of J. D. YOUNG Died Jan. 13, 1906 AE 86 Yrs. Mary V. daughter of J. D. & A. YOUNG died Jan. 31, 1864 AE 5 ys. & 7 m.